Hi Everyone, and a warm welcome to my painting blog. You may have gathered from elsewhere on my website, that I was overseas painting in New Zealand for a few months over Christmas and New Year. 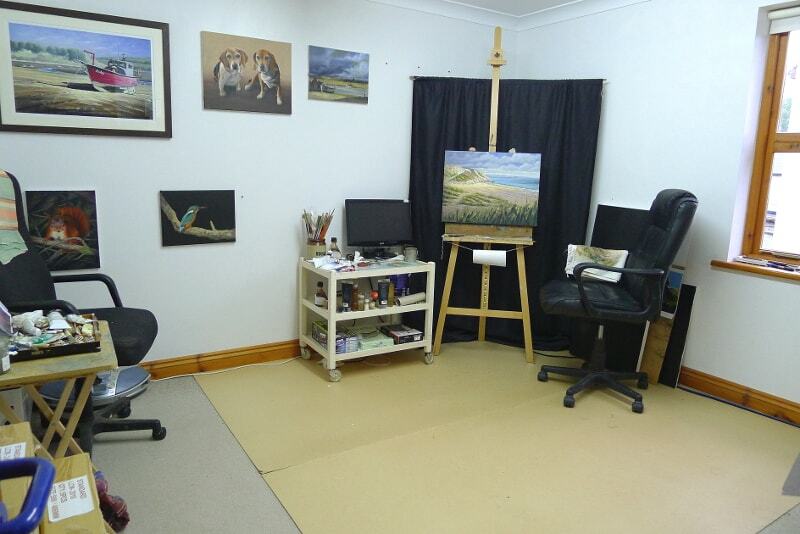 I’m back in my studio in West Wales now, and although as keen as ever to get back into it, I decided that my studio layout needed an overhaul first. Whilst overseas I was staying with New Zealand artist Karen Neal ( take a look at her art work here, you’ll love it! ), and painting in her art studio in Rarangi, in NZ’s South Island. It was great to paint in a different studio, and one of things that I noticed was that the paintings I produced whilst I was there were looser and freer than my usual work, back here in Wales. So, it occurred to me that the environment that an artist paints in greatly effects the paintings he/she produces, and with Karen’s studio happening to be more damage/paint splatter proof than mine, I felt able to paint with more freedom. This was a completely subconcious thing of course, I hadn’t planned to paint any different to my usual style, and I’m not going to tell you my NZ paintings were radically different in style, but different they surely were. So, with that in mind, since I’ve been back in Cilgerran I’ve made a few changes to my own studio. I’ve taken most of my paintings off of the walls, where some were displayed. 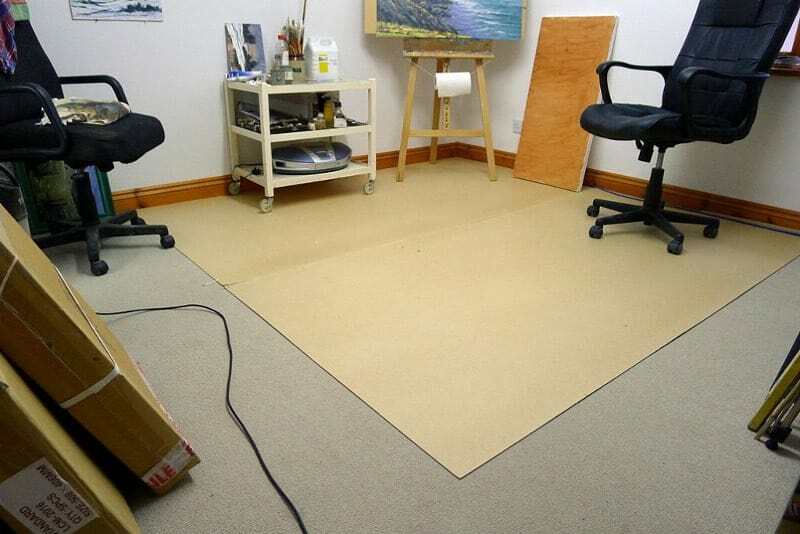 I’ve moved my workstation/desk over to the other side of my studio to give more room around my easel, and I’ve put 2 large 12×8 foot sheets of hardboard down on the floor, to protect the carpet from further destruction. I know what you’re thinking.. “..but Chris, those white walls are going to get totally covered in paint!” ..and of course, you’d be right, but next I’m planning a large black backdrop curtain hung behind my easel, which I’m in the throws of having made for me right now. This will not only take away any glare off of the white walls behind my easel, but also protect the walls from any paint splatter when I go all ‘Jackson Pollock‘ and start throwing paint at canvas from 40 feet away ( not really going to happen ). The second thing that I decided to change was to not have many of my paintings displayed in my studio, interestingly if one paints in a room full of paintings of a certain style, one tends to emulate that same style. So if you’re trying to loosen-up your painting style, don’t have tighter work hanging all around you. Get the loosest freest paintings you have, and hang them up around you! 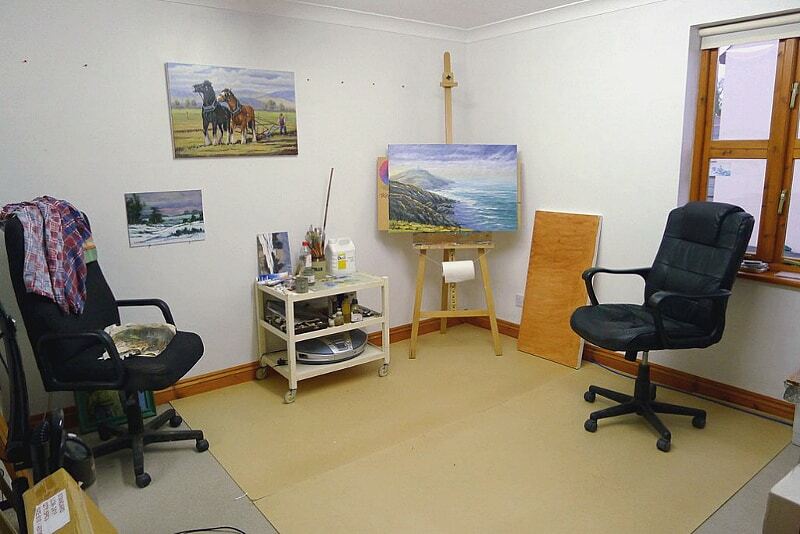 Bookmark this article How To Paint Loose Paintings. Great advice Chris! I have taped plastic decorators sheeting on my walls, I love that I don’t have to worry about making a mess. Old carpet covers the new one but might get some hardboard! Hi Lynn, it makes a big difference not having to worry about making a mess doesn’t it, very freeing. Plastic sheets are just as good, nice job!